There is something so comforting about a BBQ and a grill. Reminiscent of long, lazy, hot Summer days. Sitting outside in the warm sun, watching it set with a beautiful orange glow over the trees. Knowing that when you wake-up the next morning, you can take you time and relive the day the same way as yesterday. Enjoying all those Summer foods is one of the best things about the season. BBQs, picnics, and grill-parties are just some of the fun food occasions to partake in. Bringing together family, friends, and nature’s best. Fresh juicy fruits, crisp light veggies, grill marks on anything and everything, all dishes homemade from the salad to the burger buns. The tantalizing smells and flavors of BBQ filling the air. But no meat will penetrate this party. Why not use the beautiful fruits of the Earth to fill us up with nutrients and love? 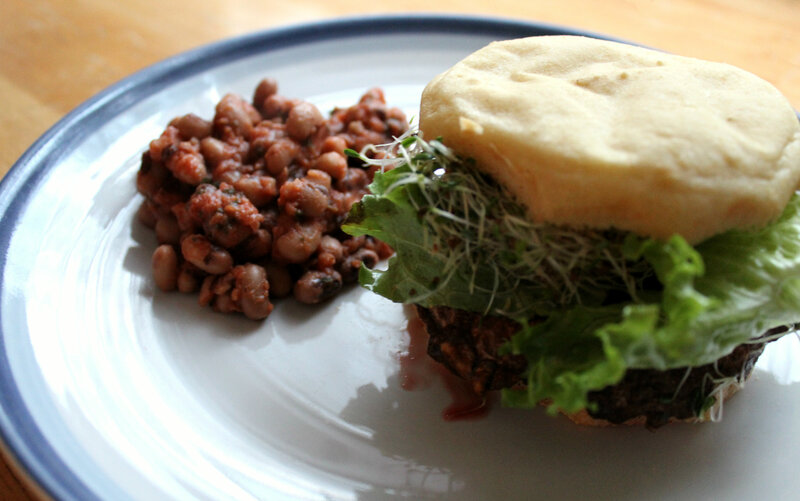 A vegan “burger” using a grilled portobello mushroom cap, fresh veggies, creamy avocado, all with a side of “baked” vegan beans. A satisfying glorious meal for any day of the year, not just Summer. Because when we think about it I don’t think this winter of 2014 is going to be ending anytime soon and those Summer days seem to just get further and further away, not closer. I need some Summer love in my life and I think I found it right here! 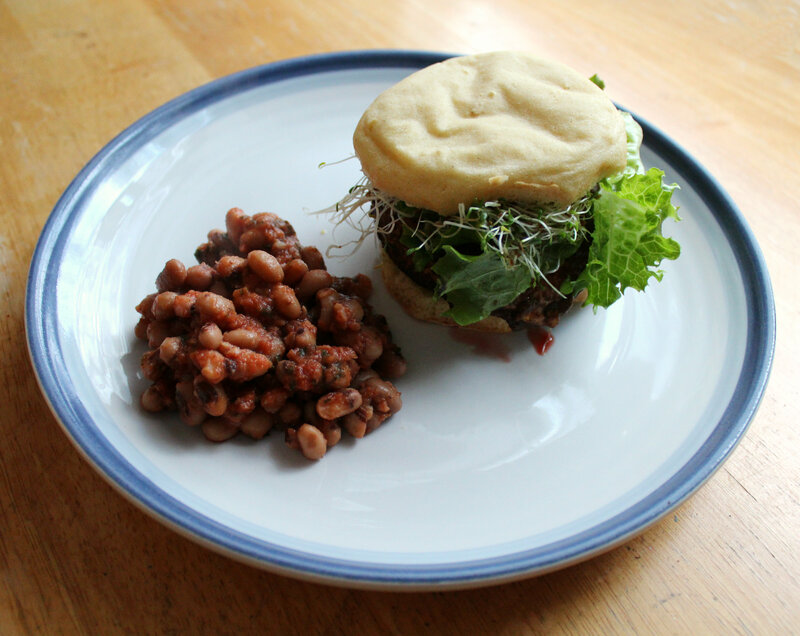 + Make the English Muffin Buns in advance if you are choosing to use that as the bun (which I highly suggest you do!) I followed Chelsea’s recipe to a T, except I added some ground cornmeal to the bottom of each of the foil muffin rings. I also suggest topping each bun with poppy or sesame seeds before baking (I forgot and am still kicking my self!). + Place all of the Marinade ingredients in a medium zip-lock bag along with the cleaned mushroom caps. Place in the fridge for 30-60 minutes. + In the meantime you can create your Avocado Mash. Cut and scoop out the avocado and add all spices to a bowl. Then just mash it all together with a fork until you have a nice guacamole texture. + For the beans, after your rinse them off, add them to a sauce pot along with all the other ingredients, stir, and heat on medium for about 10 minutes, covered. + Make sure all your topping are also prepped. Wash, peel and slice the beet. Wash your lettuce and rip into “burger” sized pieces. Rinse your sprouts (about 1/4 cup for each burger). + Then to grill your portobello burgers, heat the grill, grill pan, or use a George Foreman grill like I did. Once heated, place the caps on the grill and cook for about 3 minutes. (My grill your close so it has top and bottom grill plates so I only needed to cook my for 3 minutes total. If you are using a traditional grill with one plate, grill for 2 minutes on each side. + To assemble: Cut and warm what ever type of bun you are using. 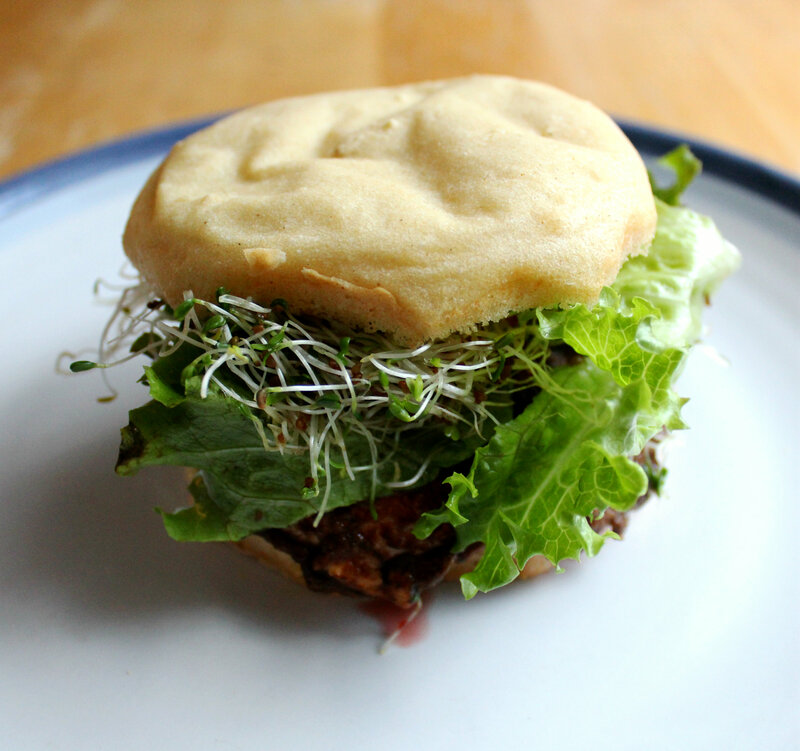 Scoop some avocado mash on the bottom of the bun, then place the beet slice, then the portobello, ketchup, lettuce, sprouts, and finally the top bun. 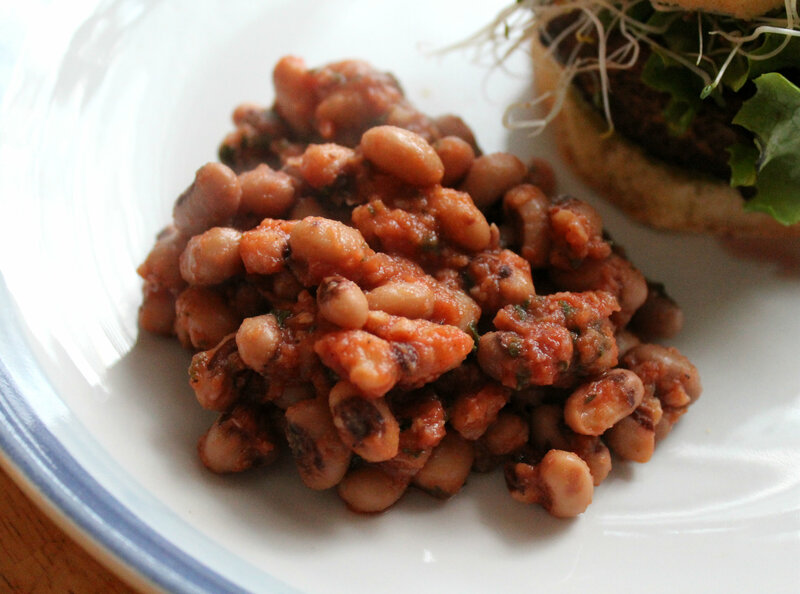 + Serve with a side of baked beans. 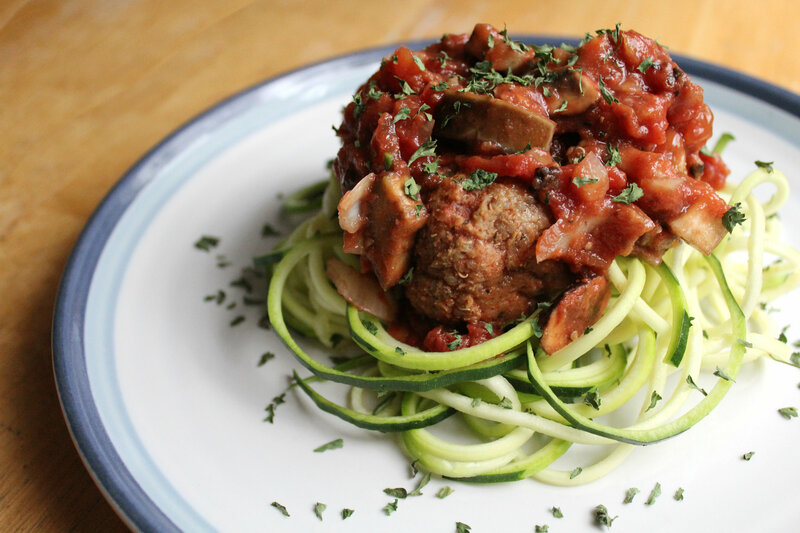 Prepare for a messy, delicious, and satisfying vegan meal! What is your favorite Summer food? Does your family grill only in the Summer or all year-round? I don’t feel like Wednesdays should be considered “hump-day”. They never feel like the half-way point. They just seem long and dragging. Come Thursday though, I start to see the light. Well, at least once I leave school on Thursday, then I start to relax knowing I have to get though only one more day. There are a few things that can make any day better though. Sunshine, moving your body (Wednesday is strength training for me!) but yoga would be fabulous as well, or being able to look forward to a yummy dinner. Something special and out of the ordinary is what I am talking about. None of the classic go-tos, but something that takes a little extra love but have a pay off that equals amazing. I got a spiralizer for Christmas as I had always wanted one. 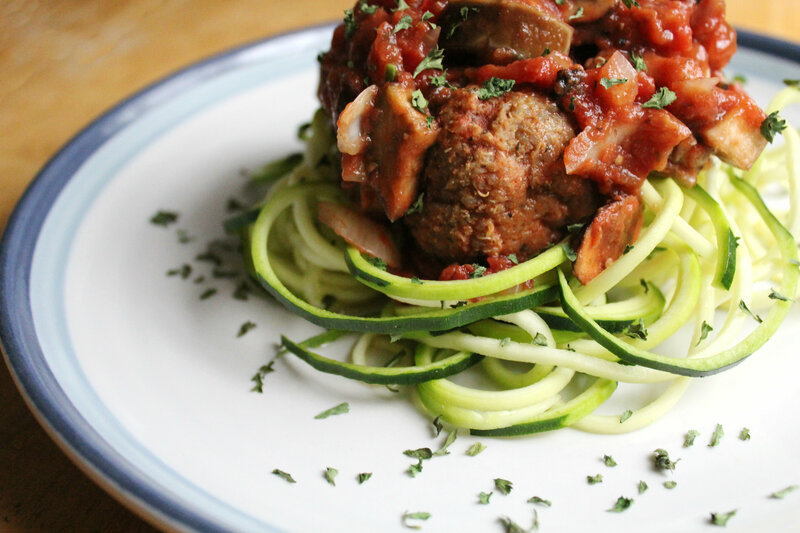 I was so jealous when I saw all those amazing recipes using zucchini noodles, sweet potato noodles, etc. So fun and unique which is right up my ally for cooking. Plus, spiralizers are pretty cheap (this is the quality famous brand that you want!). I was worried that it would just be a piece of cheap plastic and way to difficult to actually get working. O, but I was so wrong. 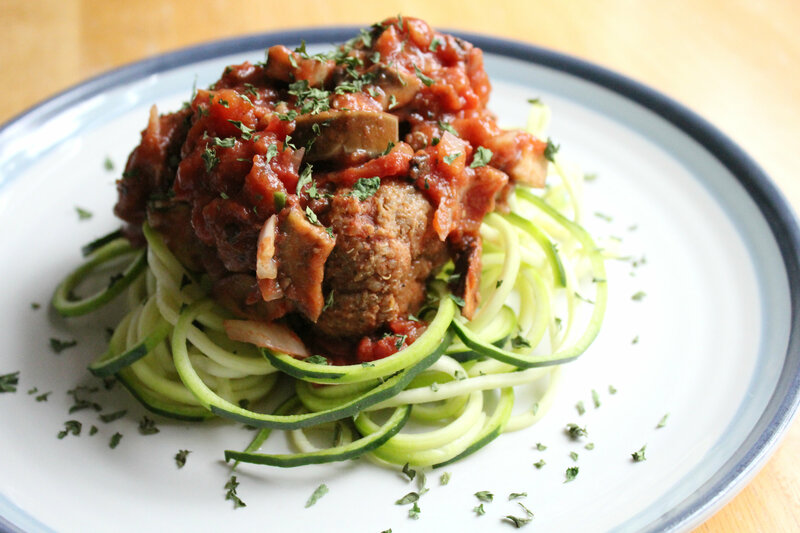 It was so easy to spiralize! All you have to do is pick your blade (there are 3), attach it, cut the ends off of the veggie you want spiralized, stick one end in the pointy circle, stick the other on the small raised circle, then just crank the handle and oodles and oodles of noodles pour out! It is so much fun, you will be addicted! 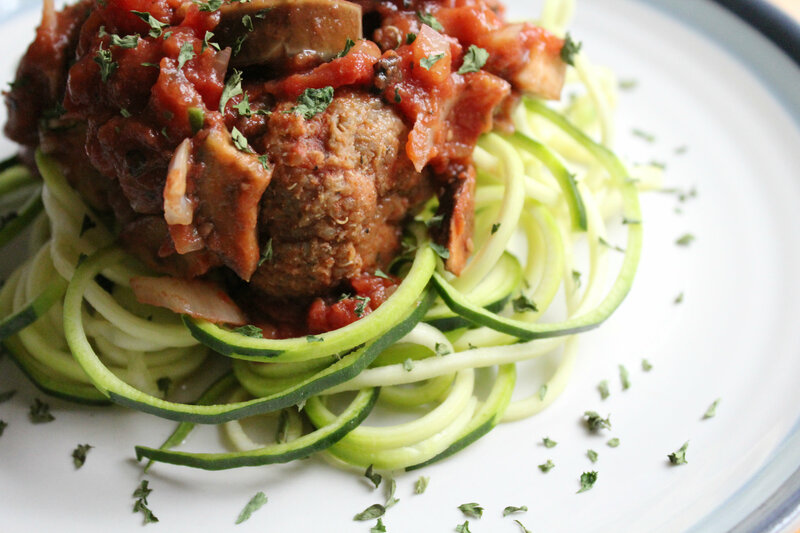 + Watch this tutorial here on how to spiralize your zucchini if you need help. Otherwise, just go ahead and spiralize and then set them aside. + For the meatballs: Preheat the oven to 400°F. Cook your quinoa and lentils in a pot with 2 1/3 cup of water for about 20-30 minutes (until the water is all soaked up). + In a blender, add the quinoa and lentils, all the spices, herbs, nutritional yeast, and egg replacer. Blend until everything is combined, but still a bit lumpy for texture. + Then prepare a greased baking dish and roll small palm sized amounts of the meatball mixture in your hands. You can make them what ever size you want but I did about 3-4 for each person. Then place in the oven and bake for 15-20 minutes. +For the sauce: Add all ingredients to a large sauce pot, stir, and heat on medium heat (covered) for about 15 minutes, stirring occasionally. + When everything is done, add the meatballs to the sauce and mix around. Then just plate form noodles and top with a few meatballs and lovely sauce 🙂 Enjoy! Remember to sprinkle with some additional parsley so it doesn’t look naked! Like I said yesterday, this would be perfect for a Valentine’s Day at-home dinner date! What are some things that always make your day better? I have been craving lentils for weeks now. Even though I have been eating them a new way every week, I still can not get enough! Not only that but my crazy mushroom love that popped up this summer is still going strong. Thus I knew exactly what I needed to buy when I stopped at the grocery this weekend. A new bag of lentils and big beautiful Portobello Mushroom caps! 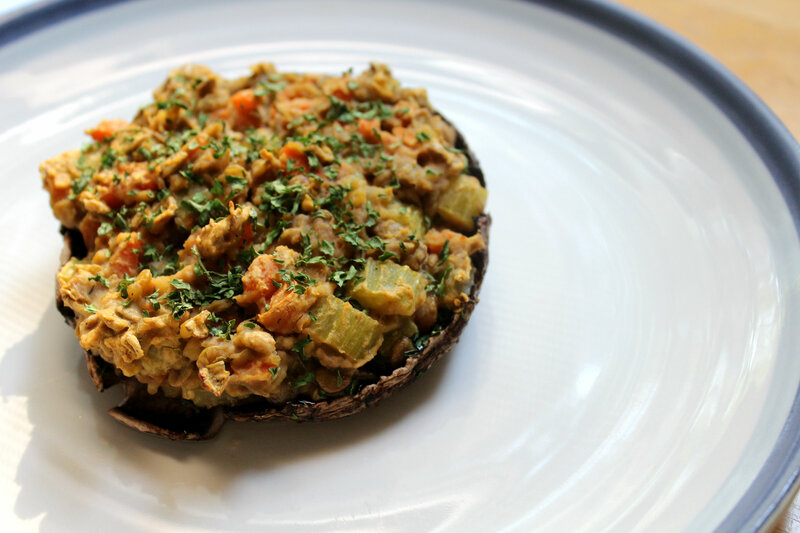 I have never made stuffed mushrooms before, stuffed peppers, but not mushrooms. I had no idea how long to bake them or how it would come out but I decided to just wing it. And like I have said before, those “wing-it” recipes are always the best. Well I was not let down with this recipe! I was so sad that I only bought two mushroom caps (one for me and one for my mom). I am pretty sure I should have bought 20 (19 for me and 1 for her). 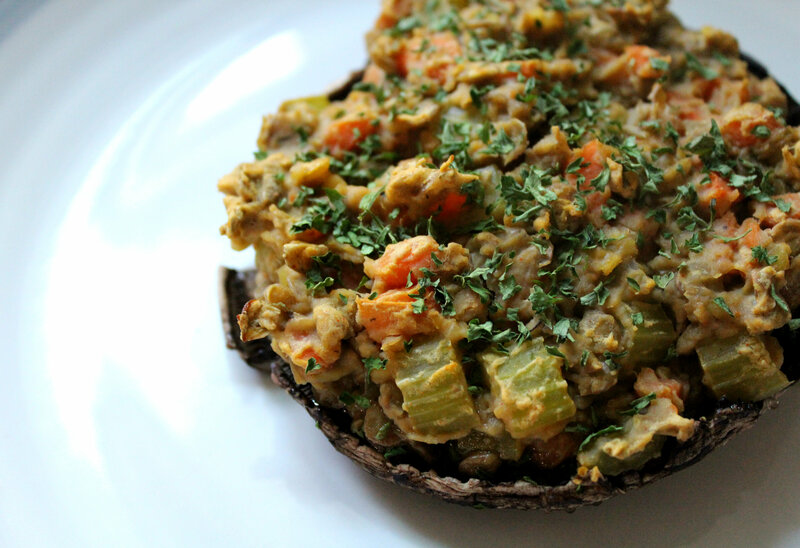 These mushrooms were so good I can not wait to make them again! – Preheat the oven to 375°F. Rinse your lentils and bring a pot with 1 cup of water to a boil. Add the lentils, cook on high for 4 minutes, then reduce to slightly more than a simmer. – In the meantime get your veggies ready and then add them to the lentils. The lentils should be done after about 20 minutes. Add the 2 TB of hummus and the rest of the spices to the lentils and smash and mash everything together. 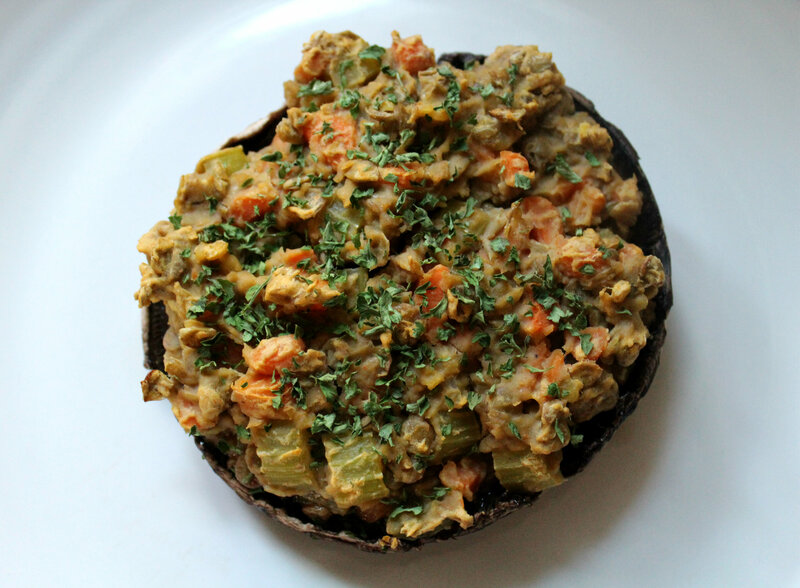 – Keep the lid on the pot and get to work on de-gilling your mushrooms. I used my trusty Micky Moose metal ice cream scoop to scoop out the gills. Once done lightly rinse the caps with water and place them on a foiled and oiled baking sheet. – Divide the lentil mixture between both caps and just scoop it right into the caps. Sprinkle some Parsley on the tops of each. Then place them in the oven for 15 minutes. Remove and Serve. Prepare to have your taste buds take a mind blowing journey. Next up I want to share a really quick and easy sweet and crunchy treat with you all. I love making this as a really quick “side dish” to accompany any main event. 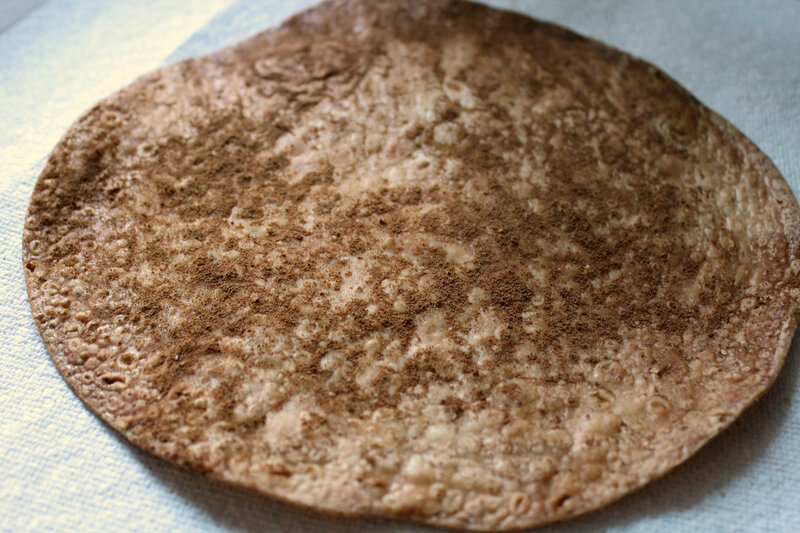 Behold the home-made cinnamon tortilla “chip”! Warm, crunchy, sweet, delicious, and 2 simple ingredients. – Preheat the oven to 400ºF. 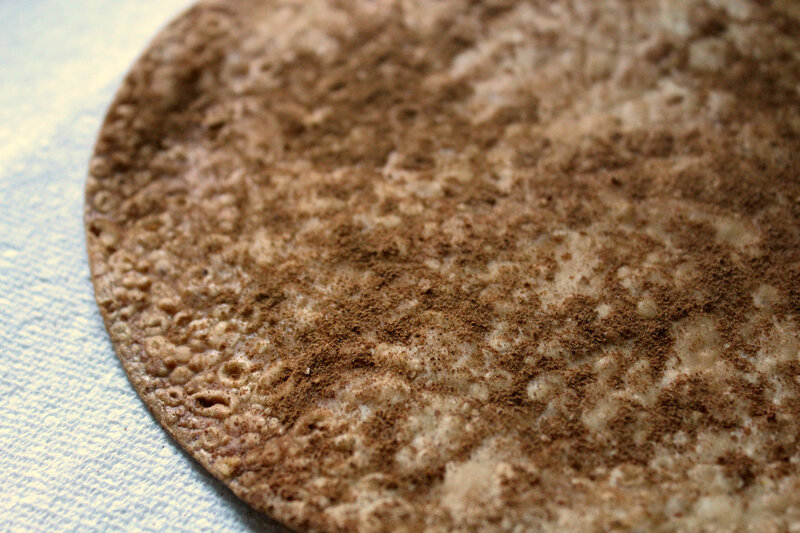 – Foil and Oil a baking sheet and place your frozen tortilla right down on it. Then go crazy and pour sprinkle cinnamon all over it. I usually rub it in then tap of the excess and repeat. – Place the sheet in the oven and let the magic happen. It usually takes about 10ish minutes but be very careful and keep taking peaks every few minutes because it can burn really easy. That has happened to me…and it was so sad. 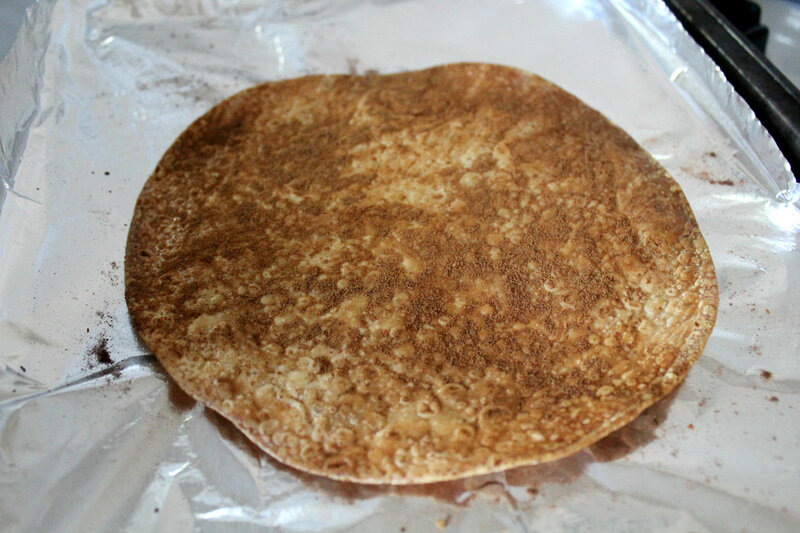 – Take the tortilla out once it is browned around the edges and crunchy! Then let it cool a few…I usually can’t wait and burn my hands, but then you can just break pieces off and enjoy the crunchy cinnamony deliciousness! 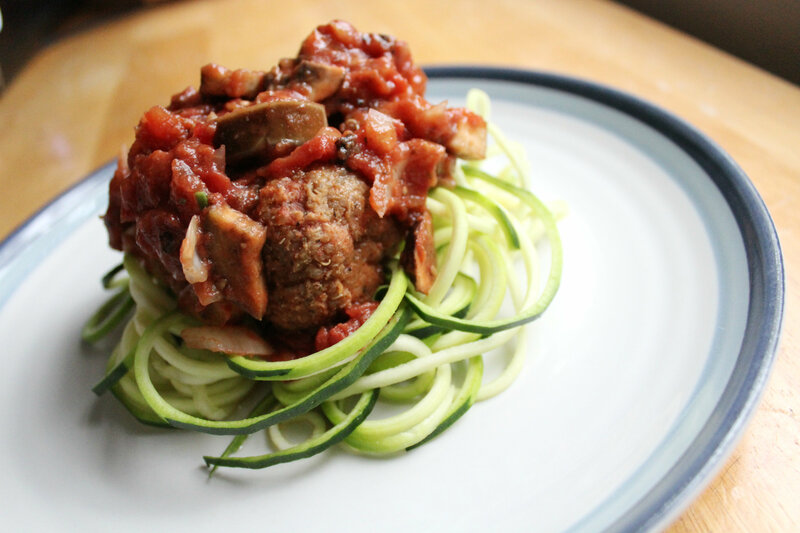 Remember to link up your favorites or recent eats with Jen’s WIAW! Thanks as always for hosting such a fun bloggie link-up Jen! Also featured on Healthy Vegan Friday! 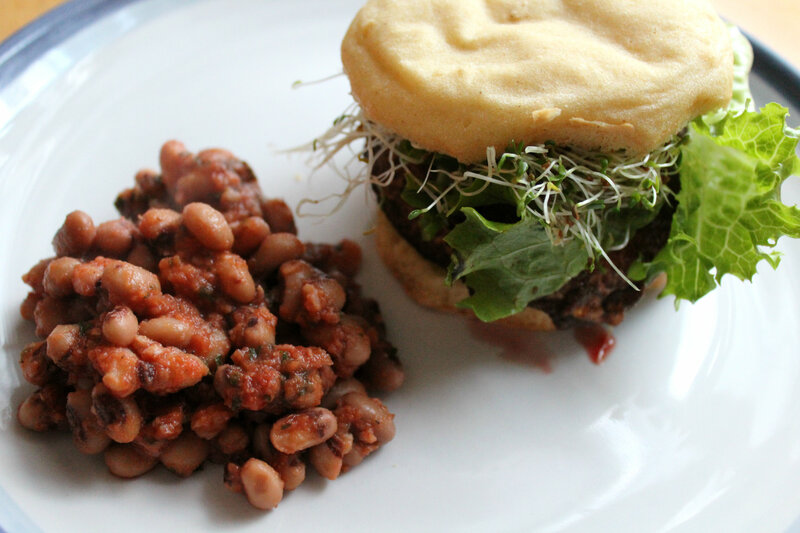 Check it out for some great vegan eats. What have been your recent food cravings? 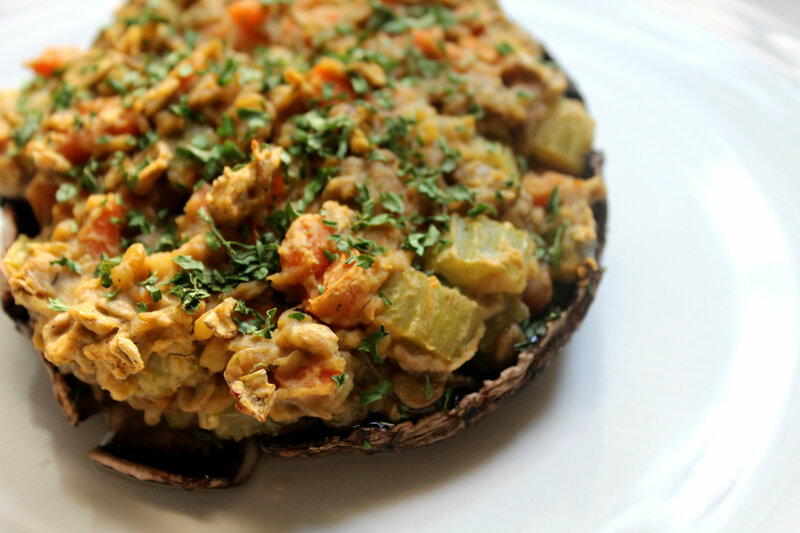 Lentils, Mushroom, and PUMPKIN! Sweet or salty, crunchy or soft? I hate salty things, that’s why i never cook with it. I like my sweet to be from fruit and spices not necessarily sugar. I definitely like crunchy things way more then soft!